"Let your actions do your talking and no one will misunderstand you." Profile: Override is a proud, loud, two-wheeled fighting machine whose favorite pastimes are tearing up roads and shooting up Decepticons. He doesn't know the meaning of the word "muffler." He figures that if people can hear him from a distance and know that he's coming, they're less likely to hang around and mess with him when he gets there. Even though his style is to go into battle with guns wildly blazing, he's more concerned with keeping the roads he travels clear of innocent vehicles for his safety than for theirs. He worries that in their confusion to get away from him, some of these vehicles might accidentally bump into him, leaving a dent or worse. Override is vain to a fault. He spends most of his non-combat time polishing his steel skin and lubricating his joints. As much as his fighting prowess inspires fear in his enemies, his reaction to any poor unfortunate who accidentally scratches his surface inspires even more fear in his friends. Abilities: In cycle mode Override is equipped with an armored, reinforced windshield that is made of a special diamond-plastic alloy, which can withstand all explosive and energy beam weapons fire. 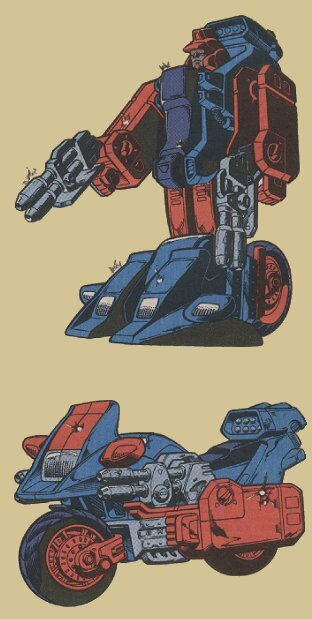 He is also equipped with two double-barreled, side-mounted, armor-piercing particle beam cannons, which he can also use in robot mode. His maximum speed is 220 miles per hour and his range is 1200 miles. He can shift into "override gear" by engaging his rear-mounted rocket pack. This enables him to accelerate to 500 miles per hour within 1.5 seconds and maintain that speed for up to 90 seconds. Weaknesses: Use of the "override gear" for more than 20 seconds at a time leaves Override physically weakened and vulnerable to attack. However, since he generally uses this gear to escape attack by outracing his enemies, he seldom finds this a problem. Given his sensitivity about his finish, the slightest nick to his surface can send him into a tailspin of depression and leave him a useless, emotional wreck - at least until he or someone else repairs the defect.